Leather Door Installation with Bronze Buttons! We worked with designer Emily Butler to create these two beautiful rooms! Annual deck maintenance will forestall repairs, protect your investment and boost your enjoyment of your outdoor space! It’s a good idea to establish a routine of upkeep that’ll protect your deck and prevent expensive repairs. We suggest applications of clear sealers and toners annually. Stain Finishes can be re-applied every other year. When hiring a contractor for either exterior or interior work, ask how long they believe it will take to finish the project. Contractors need to be schooled on how certain coatings perform and their dry time. We have seen inexperienced painters who do not give coatings enough time to dry and often not use a primer. These poor habits eventually lead to paint failure. About Houzz – Houzz is the leading platform for home remodeling and design, providing people with everything they need to improve their homes from start to finish – online or from a mobile device. Get the Deal of the Season on Painting! NOW IS THE TIME TO PAINT and we have off-season decorating opportunities! Get the best deals of the year before the spring exterior season hits! We are offering $250 off any job over $1,500 that is performed by March 15, 2015! 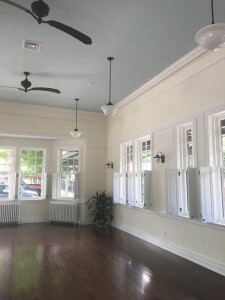 Posted in Tags: interior, interior painting, New Ideas-Great Deals and tagged gregoras painting, painter fairfield, painter new york city, painter westchester, residential painter, residential painter westchester. Bookmark the permalink. Another Idea For An Accent Wall! Here is an unexpected spot to add color: the bookshelf! Why limit yourself to the walls? This photo shows our team during a project where we painted the wall behind shelving. A Standout Look for Your Bath! Painting a bold, bright color in a bathroom can give it an inviting feeling, as well as open up the space! We recently created this striking look for our customer, utilizing a pink color with a brilliant hi-gloss finish. What a dramatic effect! Posted in Tags: Bathroom and tagged bathroom, bathroom interior, high gloss paint, highglosspainting, interior, interior painting, john gregoras, johngregoraspainting. Bookmark the permalink. In this time of gratitude, we give thanks for you, our customers. We value your patronage and appreciate your confidence in us which is something for which we are grateful for. We wish you a very happy Thanksgiving! Posted in Tags: Holiday Greeting and tagged gregoras painting, john gregoras, john gregoras painting, painter fairfield, painter new york city, painting Westchester, paper hanging, residential painter, venetian plaster, venetianplaster, wall covering, wall paper, wallcovering, wallpaper. Bookmark the permalink.